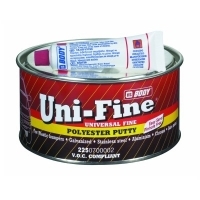 Two component fine polyester filler/stopper, suitable for application over all metal surfaces (galvanized steel, aluminium, stainless steel, bare steel, chrome). Also suitable for plastic bumpers (excluding PE), polyester substrates and existing painted surfaces. Easily applied and extremely easy to sand with P 150 – 400 grit paper. 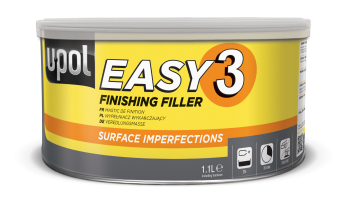 Produces a perfect pinhole free surface without clogging sanding materials. Can be air dried or dried by using either short or medium infrared lamps. 1460g filler + 40g hardener.